Ideal for research or repetitive laboratory work on small samples. 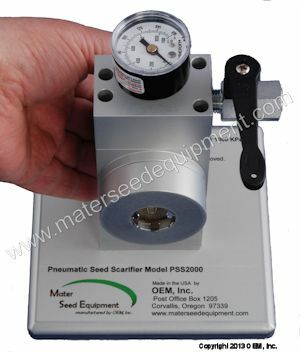 Quickly load and process small seed samples. Cleans with a blast of compressed air. Two instruments in one: can be used as either a scarifier or debearder. With the abrasive liner it functions as a scarifier. Or slip in the smooth tempered steel insert and it becomes a debearder. Capacity of up to 3 grams. Pressure Gauge, one Abrasive Liner 2 pack and one Tempered Steel Insert two pack. compressed air source of 75 psi (5 bar) minimum.